Gluten Free Angel Biscuits | Great gluten free recipes for every occasion. I’m thinking that we might want to make some gluten free angel biscuits for Easter this Sunday. It seems … almost like a religious experience. If you’ve ever had trouble making biscuits (or, to be honest, even if you haven’t), then this is the pastry recipe for you. With baking powder, baking soda, and some yeast, they rise like angels. Get it? The temperature situation did pose a bit of a cognitive dissonance in my mind, to be honest. I mean, yeast likes warm, and pastry (like biscuits) needs cold fat (like butter) to expand in the oven. Pastry is really all about architecture as much as it is chemistry. The big chunks of cold butter, surrounded by flour, expand when they hit the warmth of the oven and push out the flour all around. Puff! But then how is the yeast supposed to proof?? I’ll tell you how, sister (brother?). Tender, light and flaky angel biscuits, with a bit of extra flavor from the yeast development—not to mention biscuit-rising insurance. Do you hear them singing? *In place of the mock Better Batter + nonfat dry milk + cornstarch, you can use 2 1/2 cups (350 g) Cup4Cup gluten free flour, or my mock Cup4Cup blend. In a large bowl, place the flour, xanthan gum, nonfat dry milk, cornstarch, baking powder, baking soda, sugar and yeast, and whisk to combine well. Add the salt, and whisk again to combine. Add the chopped and chilled butter, and toss to coat it in the dry ingredients. Flatten each chunk of butter between your thumb and forefinger. Create a well in the center of the dry ingredients and add the buttermilk, and mix until the dough begins to come together. If necessary, press together with floured hands, handling it as little as possible. Turn out the dough onto a lightly floured piece of unbleached parchment paper and press into a disk. Place another piece of unbleached parchment paper on top of the dough, and roll out into a rectangle that is about 1 inch thick. Remove the top piece of parchment paper, sprinkle lightly with flour, and fold the dough over on itself like you would a business letter. Sprinkle the dough again lightly with flour, replace the parchment paper and roll out the dough once again into a rectangle about 1 inch thick. Once more, remove the top piece of parchment paper, sprinkle lightly with flour, and fold the dough over on itself like you would a business letter. Sprinkle the dough again lightly with flour, replace the parchment paper and roll out the dough, but this time into a disk about 1/2 inch thick. Peel back the top piece of parchment paper, and, using a floured 2 1/2-inch cookie or biscuit cutter, cut out rounds of dough. Place the rounds about 2 inches apart from one another on the prepared baking sheet. Gather and reroll the scraps, cut out as many more round of dough as possible, and place on the prepared baking sheet. Cover with an oiled piece of plastic wrap, and place in a warm, draft-free location until nearly doubled in size (about 1 hour). Place the covered baking sheet in the freezer until firm (about 15 minutes). Remove the baking sheet from the freezer place it in the center of the preheated oven. Bake until the biscuits are puffed, very fragrant and lightly golden brown around the edges (about 12 minutes). 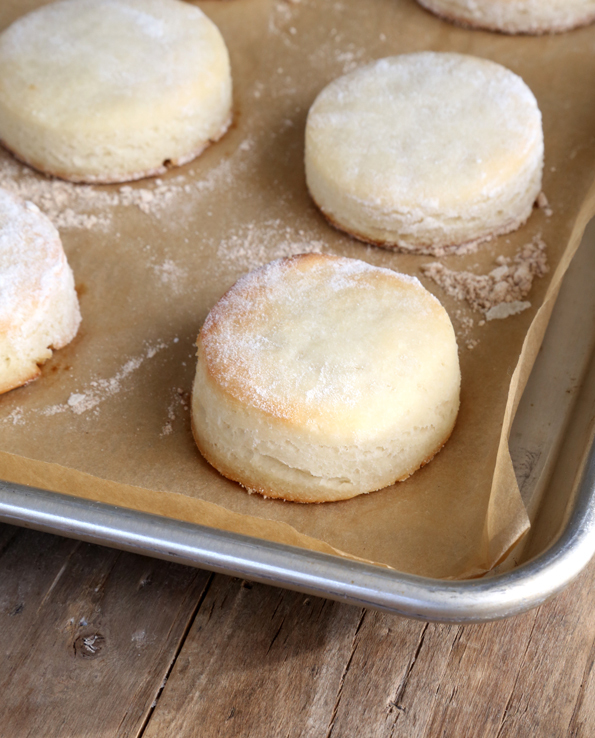 Remove from the oven and allow the biscuits to cool briefly on the baking sheet before serving. P.S. If you haven’t yet, please pick up your copy of Gluten-Free on a Shoestring Bakes Bread! Your support keeps me going, in more ways than one! , I omit the cornstarch and nonfat dry milk powder? I know you can use arrowroot in place of corn starch. Would that leave a taste? Hi, Sandy, the nonfat dry milk and the cornstarch are separate ingredients. They are not replaced by the all purpose gluten free flour. This is SOOO awesome! I made biscuits like this for the breakfast crowd at the last restaurant I worked for! I had to make sure my biscuits would be GIGANTIC. I always used the puff pastry dough method then one day decided to add yeast like similar to my cinnamon roll dough. I cut these with a handmade cutter so they could be at least 2 1/2-3 inches across and 2 1/2inches high. People started asking for cheese biscuits so next I just started folding sharp cheddar cheese into the dough. This was my job twice a week. Along with the cinnamon rolls and pancake batter. I am soooooo happy to see these come back into my life!!!!!!!!!!! I read through all the comments and did not find whether these will freeze well AFTER being baked. Is there a way to make these dairy free? I haven’t made these with any substitutions, Gabrielle. You can try coconut milk powder in place of the nonfat dry milk, shortening in place of the butter and soured almond milk in place of the buttermilk. But that’s a lot of substitutions! Hi Nicole, i’ve searched for a nondairy coconut milk but for some reason they add milk proteins to it. I have a severe milk protein allergy so I look out for that. I ended up using rice milk powder or soy milk powder. In making biscuits from your first/second(?) book, can’t quite remember which I have all three, I subbed Earth Balance for the butter. I ended up using my 5lbs of Better Batter for biscuits because my 17yr old told me I had to make enough to last him for 2 weeks. The freezer is an awesome friend…. Hi, Sonya, I’m glad you had success using Earth Balance in place of butter, but for the benefit of others, I do not recommend Earth Balance for pastries. It has a very high water content, and tends to melt into the flour instead of creating layers as it expands in the oven. I adore angel biscuits and it’s one of those things I’ve had in the back of my mind to convert to GF “someday.” Now I don’t have to wait till I get around to it. Thank you! Thanks, Nicole! You are so very helpful! I think I have it all figured out now! I have both your books on my Kindle and am slowly cooking through them — enjoying baking again! These look beautiful, hope you have a lovely Easter! WOW! You’ve done it again girl! Angel Biscuits have been a favorite of mine for many years…Did you hear me thinking about them recently????? I used to make up a 5 cup of flour batch. 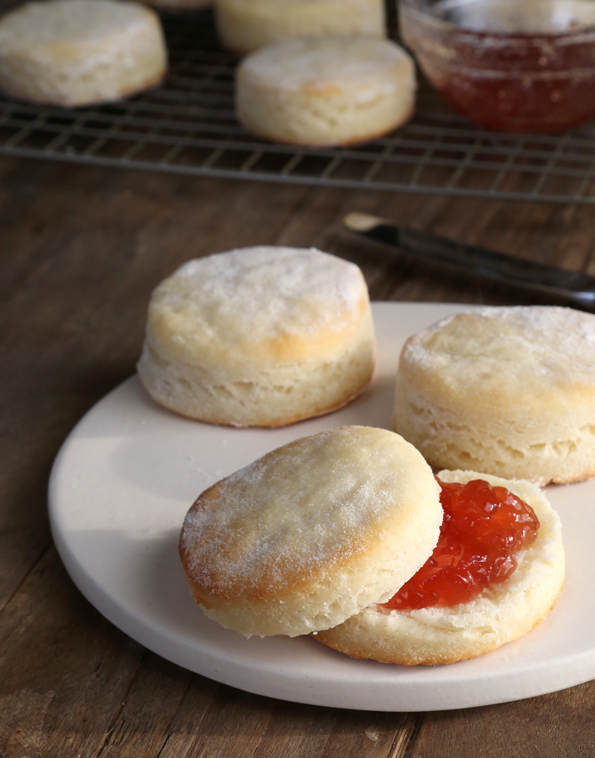 I would bake a few and leave the remainder in a bowl in the fridge for a few days so I could have half a dozen hot biscuits whenever I wanted them. They are soooooo good and everyone seems to enjoy them and find them a little special (is it a biscuit or a bun?). You just keep Rockin’ Lady! Saw a non-gluten free recipe today for Sticky Lemon Rolls with Lemon Cream Cheese Glaze…like a cinnamon bun with lemon and nutmeg instead of cinamon…..any thought to tackling something like that? Ohmygosh- lemon cinnamon rolls sound awesome! So true, Lorna. Angel biscuits are sort of a cross between a biscuit and a bun. Love ’em! Those sticky lemon rolls sound fabulous. You could definitely use the recipe in my bread cookbook, Bakes Bread, for cinnamon sticky buns and add some lemon juice and/or zest to the glaze! I have a question about the nonfat dry milk. I bought some nonfat dry milk, but it is already a very fine powder. It is not instant dry milk. Your recipes don’t say “instant,”so I wasn’t sure if what I have is ok to use. And you asked if we could hear the biscuits singing? It’s a veritable oratorio!! I’m honestly not sure, Angie. I buy Carnation instant nonfat dry milk, and grind it into a finer powder. Otherwise, the final product has flecks of powdered milk. I don’t know how fine yours is, so I really can’t say! Ah…mine says “non-instant nonfat dry milk.” I measure by weight, so the amount shouldn’t be an issue. I wonder if there’s any difference in the product itself as far as how it works in the recipe. It’s not a matter of the amount of the ingredient, Angie. It’s a matter of the grind of the powder. Can I skip the cornstarch? We have a corn allergy here. You can’t just skip it, Moe. Feel free to experiment with another starch! I’m just curious, why the freezer blast at the end? I never have any freezer room so I’m wondering if I can make them without the chill. As I explain the post, S. Harris, pastry needs to be cold for the butter to expand when it hits the heat of the oven, so it fluffs out the flour around it. Ah yes, I see. Well I guess I better make some room in my freezer because these look super tasty. I’m always on the lookout for a tasty GF biscuit! Not really, Lucy. Those are more cakey, less flaky, I’d say. 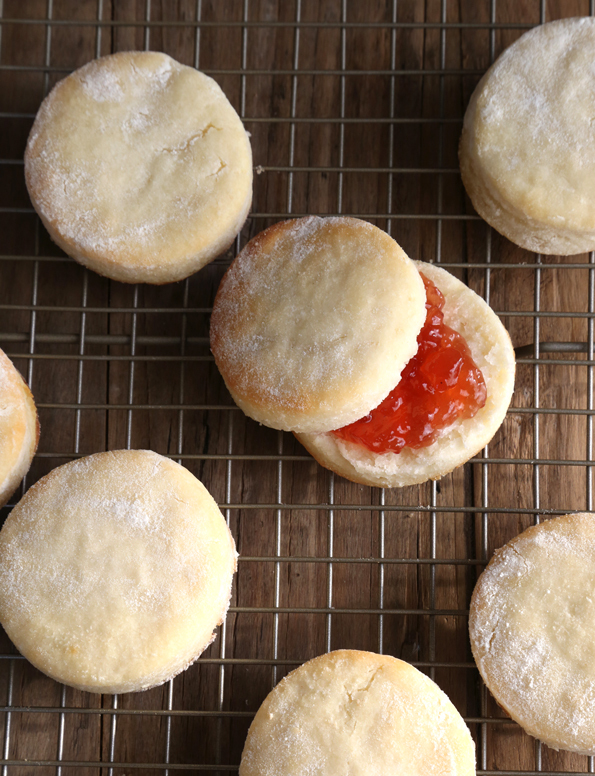 These are flaky, more like traditional biscuits. Okay…..we’re having Easter dinner after the evening service — could I put these into the refrigerator after the rise for the approximately 2 hours we’ll be gone instead of the freezer and then bake when we get home — will that kill the yeast? You can leave them in the refrigerator before they rise, but you’ll still need to allow them to rise at room temp (at least) before chilling and baking them. I would not keep them in the freezer for an extended period of time. There’s no way of knowing whether or not it will kill the yeast. yum! I love your biscuits…..if I didn’t fold as much would they be ‘fluffy’ I wonder? I’m going to try it when we get back. ewww. I just realized saying that I loved your “biscuits” could sound gross. I did not mean it that way! Doesn’t sound gross to me, Jennifer! I’m not as young as I once was. I gotta take it where I can get it. And I would definitely do the folds! Aaand just like that….Sunday dinner solved! Thank you Nicole!!!! John, whatever my problem is, YOU are the solution. Hi Nicole! Quick question, could you freeze these right after the rise and then bake as needed? We’re headed to CT for Easter and I was wondering if I could take these frozen and bake when needed…. thanks! You’re, as always, fantastic! Good question, Beth! I’m a little reluctant to say yes, since freezing yeasted dough can, in fact, kill the yeast. And I honestly don’t know what would happen with already-risen dough that is left to truly freeze solid. I think it would be hit or miss! My advice? 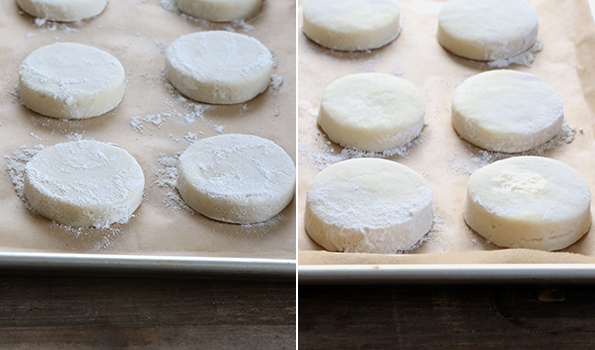 Make regular, non-yeasted biscuits and freeze them (try the Extra Flaky Buttermilk Biscuits from Bakes Bread, or the Sausage Biscuits and Gravy biscuits from here on the blog). Those, I know, will do great. No–freezing doesn’t kill yeast–you can freeze pizza dough and bread dough and it will rise–just takes a longer time to do so. I store my yeast in the freezer to keep it from going bad. 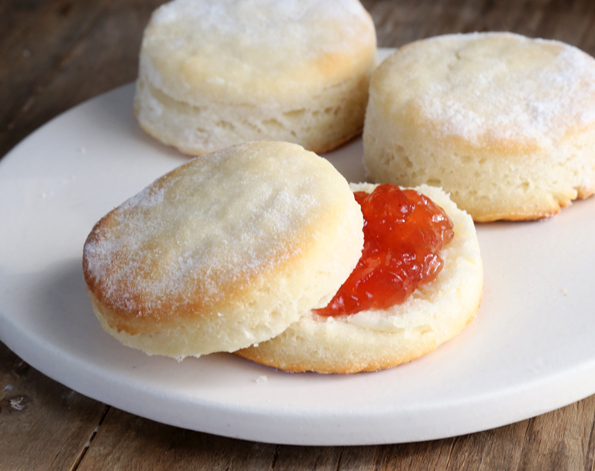 I have had good success with baking powder biscuits without using yeast–and they rise beautifully. The secret is COLD ingredients–and don’t cut the fat in too much–leave pea size pieces. Then into the screaming hot oven. And don’t twist your cutter as you cut them. That seals the layers so they cannot raise. Just straight down and back up with a sharp cutter. And be sure to use aluminum free baking powder. Don’t buy anything with aluminum in it to consumer–or go on your skin. Cheryl, these are Angel Biscuits, which contain both chemical leaveners (like baking powder and baking soda) and yeast. And you can store yeast in the freezer before it is activated in dough. Afterward, it can, indeed, kill the yeast. It doesn’t usually, but it can. That is why I do not recommend it. I have a number of other pastry recipes on the blog and in my books that describe how to get light and flaky pastry by using cold ingredients and layering the fat with the flour well. leaving little pockets of goodness ie: flaky crust. I think Nicole has left her law degree far behind and become a food scientist. She’s done what a lot of us can’t do or have time to do…made recipe after recipe and threw away recipes until she refined it. Hope she has a few puppies around! Those are some good looking biscuits, sister. You are the best!